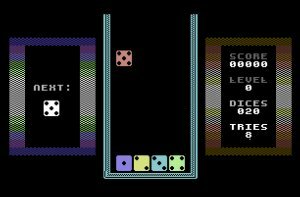 Like most puzzle games, Super Seven doesn?t really have a story line; in this case the simple premise is to match two dice of the same denomination as one falls from the top of the screen and the other cycles past at the bottom. First off, Super Seven?s�graphics get the job done but there?s�very little to them. Hi-res graphics can be incredibly bland even with colourings and that?s�what has happened here, so while the dice are functional they?re also quite frankly boring, the surround is simple and the status boxes look very primitive. Most of the classic puzzlers make up in part for their simple nature by at least trying to wow the player a bit on the sound and vision fronts, to it?s�credit, Super Seven?s�ingame music is reasonable and at the very least unobtrusive but is probably the high point of the game because the graphics are sub standard for the genre. But the worst problem has to be the gameplay, the initial concept behind the game is flawed so it?s�very simple to just push the falling die over to the left and simply sit there waiting for a match before pulling down to make the connection. This �technique� seems to work all the time and, apart from the occasional slip which is impossible to avoid occasionally, the only real problem most players will have is that it becomes repetitive very soon. Even with the aforementioned tarting up, it wouldn?t improve the game. 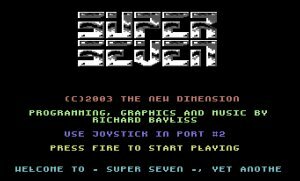 Puzzle games on the C64 (and indeed most platforms) are ten a penny simply because they?re fairly easy to knock out, Super Seven does little to raise itself out of the mire of simple and flawed puzzlers that already exist for the C64. With a little more thought and a few reasonably simple tweaks to the gameplay (and preferably a graphical overhaul) it could have been far more playable.